We are engaged in manufacturing, exporting and supplying a huge range of Pneumatic VFFS Machines for liquids & pastes. 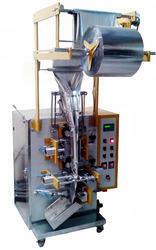 These machines are suitable to Pack Shampoo, Hair Oil, Tomato Ketchup, Cream, Food Paste, Grease, Chatni etc. in three side seal/ four side seal & center sealed sachets. We take into account the international quality standards set by the industry and fabricate the best quality FFS Machine. filling range up to 10 ml. no. Of tracks (2) double track. sealing type 4 – sided sealing. machine packing speed approx. 30- 35 sachets per minute per track (. I. E 60 to 70 sachets per minute). main motor 1 h. P.
electrical supply & requirement 3 x 415 v ac +/- 10%. Approx 2. 5 kw. 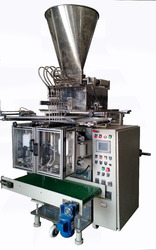 We manufacture and export Automatic Liquid Pouch Packaging Machine/ Liquid Piston Filter Packaging Machine (Automatic Collar Type FFS Machine with Liquid Piston Filter) that is Suitable to pack various types of liquids & pastes like grease, tomato paste, food paste, Idly paste, pickles paste, cream, Chatni, edible oil, mustard oil, refined oil etc in center seal / three side seal PP/ LDPE bags. Our product are having such optional features Coding Unit, Gas Flushing, Guessetting, Strip Cutting, Bucket Elevator. Therefore, our customers can be assured that they are getting the best. 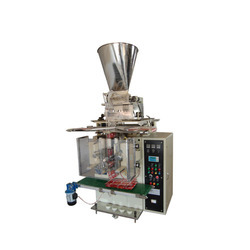 We are the manufacturer and exporter of Pneumatic Liquid Filling Machine/ Automatic Pneumatic Type FFS Machines offered by us can be used in different finish forms as per the specific process applications. 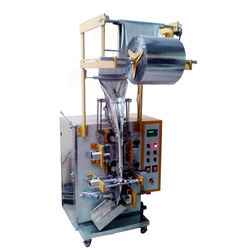 Automatic Pneumatic Type FFS Machine are Suitable to pack liquid items & pastes like Oil, shampoo, tomato ketchup, grease, mobile oil, chatni & food paste in three side/ four side/ center seal pouches. Packaging Details: Sea worthy wooden pallets on chargeable bases. No. of Tracks Single track. Machine packing speed Approx. 30- 35 sachets per minute per track. 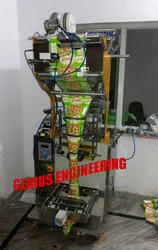 Production Capacity: 30- 35 sachets per min. Upto 120 – 150 sachet per minute. Continuous heat selable laminated film in roll form. Packing film unwinding is done by dancing roller, proximity sensors and unwinding motor. No Tension on the packing film while unwinding. Yes. Photocell mark registration system. 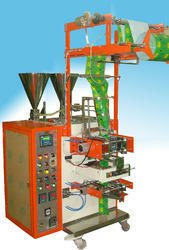 dk- 20, p & f make or sick make (auto color teach facility). We are engaged in manufacturing, exporting and supplying a huge range of Two Track Piston Filler Machine is an automatic two track Vertical Form Fill Seal Machine. 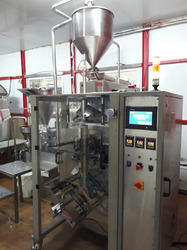 Our machines are suitable to pack shampoo, hair oil, tomato ketchup, cream, food paste, grease, chatni etc. in four side seal sachets. We take into account the international quality standards set by the industry and fabricate the best quality FFS Machine. Filling Range Up to 50 ml. 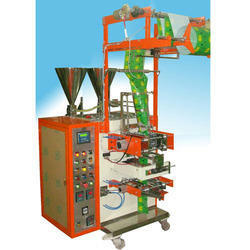 We are a highly reputed organization for providing a high quality range of Multi Track Form Fill & Seal Machines. Available in 2, 3, 4, 6 & 8 tracks. These machines form, fill and seal liquids, suitable to pack shampoo, hair oil, tomato ketchup, cream, food paste, grease, chatni etc. in four side seal sachets.